Have you ever been in a storm? I’m not talking about a simple thunder shower, with its occasional soft booms off in the distance and gentle downpour; a time just perfect for napping. No, I mean a storm. You know the type that sounds like angels are remodeling the heavens? The kind of storm with piercing cracks of lightening, body jarring thunderclaps that rattle windows and frighten little ones. The sort of storm with ominous clouds that thwart any effort of the sun to peak through, wind that leaves nothing but destruction in its wake and that appear to be never-ending. I’m talking about that kind of storm. Can’t you just picture a storm like this? Can you imagine the noise level? How about trying to listen above all of that noise? How can you be sure of what you are hearing, or seeing for that matter? Can you envision the distractions a storm like this could bring? Perhaps you have been in this type of rain that falls so heavy you can’t see what’s in front of you! It is important to know what safety precautions to take during times like these, to be able to discern what you are hearing, and to tread carefully so as not to be washed away. 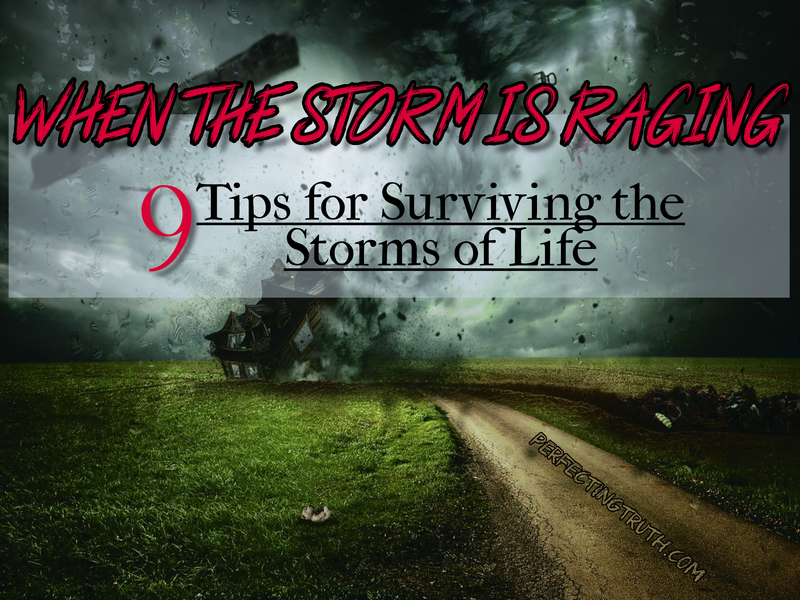 I know storms, and it’s just as important to know what to do during the intense storms of life. As I’ve mentioned before I’m the oldest of 8 children. I was also what psychologists would consider an emotionally and functionally parentified child; it isn’t that unusual when you are the oldest kid in a large family. In my family I wore (and in some ways still wear) many hats; caregiver, caretaker, cook/ housekeeper, protector, confidant, counselor, teacher and even provider – just to name a few. When I was growing up we were always in one storm after another. Even during the occasional reprieves there was a storm looming just over the horizon. I became very good at judging the clouds and detecting the rumbling in the distance, even when things seemed calm. It’s not easy to carry adult burdens as a kid; the issues are beyond your years, and you naturally lack the wisdom and experience to deal with them correctly. I handled things as best I could and, with my “oh so responsible” self, tried not to add to the issues; however, this led to literally forgetting about myself altogether, which caused me to feel like a thing rather than a person. There were many times I wanted to run away, disappear, be someone/anyone else and yes, at times I even wanted God to just “call my number already!” so I could just be done with the constant turmoil that was my life. God knows best, however, and He gave me the strength and character to stand instead. Hallelujah! I am no stranger to life’s storms, so allow me to share a few of the lessons I’ve learned from my experiences. Hopefully, if you find yourself in the midst of a raging storm or one that seems to be trying to last till the end of time, what I’ve learned will help and encourage you. 1.ASK THE LORD FOR HELP! When storms are hitting hard, and you don’t know what to do, ask God for help. Due to a number of factors I did not understand this way back when. I would ask Him to help others, but seldom if ever asked for help for myself. Looking back I think it was because I didn’t believe He would hear me regarding myself; crazy I know, but that’s the truth. Thank God for His patience and compassion towards me. Now I know better than those wrongly reinforced notions I had about Him for so many years. Sometimes people would comment on my role in the family e.g. relationship with my mom or the fact that I would buy groceries with what money I received. At one point, during one particularly tempestuous time, I had some (even family) try to give me the “save yourself” advice, knowing my dad had just walked out, slamming my mother into single parenthood (8 kids) in one fell swoop. I was supposed to just drop them like a load of hot bricks – to kick them while we were down? Their words quickly sent up red flags, and I knew exactly who was behind the veiled message. Say what you will, but I could not do that to my family, and I know without a doubt that God definitely would not have been pleased with me! The Enemy can and will use people. During difficult times their words can get tangled up with your emotions and cause you to make your situation worse. Never let your emotions/feelings be the deciding factor, and never keep listening to counsel (no matter how neatly packaged) that you know will be destructive or out of the will of God for your life. Remember Adam and Eve? Where would we be if they had not continued to listen, and eventually obey, the enemy of our souls? When going through turbulent times it is imperative that we keep our heads. Emotions all around you will typically be running high, and your emotions will no doubt be at the brink. Keep it together my friend. When the pressure’s on every side, that’s when emotions love to take control. This is when you can say and do things that can cause permanent damage. When the dust clears, and the storm is over, you do not want to look around and see destruction that you caused by letting your emotions have the upper hand. When you start to feel out of control, do the opposite of what you feel; trust me, this works. You want to scream? Deliberately whisper. You want to throw something? Purposefully put it down gently. You want to hit somebody? Hug them. Can’t hug them? Then quietly walk away etc. Are frustrations driving you to the breaking point? Pray! Cast all your cares on the Lord; He really does want them ALL (1 Peter 5:7). Love, in the midst of raging storms, will help you not to fall prey to becoming selfish/self-centered. Love helps you put the needs of others ahead of your own. Love helps you look at people through eyes of mercy, compassion, and understanding. Love causes you to go the extra mile even when you feel (or maybe even know) it’s not mutual. Love helps you do the right thing when all you want to do is retaliate. Love helps you hang in there when everything in you wants to walk away. When I was advised to leave my family and “save myself,” I might have done it if I did not love them. Some of the persuasive arguments of others, especially when I knew they were coming from a place of honest concern for me, just might have worked if I did not love my family. Oh…My…Goodness! I cannot stress this enough! Have you ever seen unforgiveness, bitterness and resentment in all its raw, ugly, evil glory? I have, and it is NOT pretty. When people harbor unforgiveness, bitterness and resentment they are often hard to deal with, sometimes downright fear-provoking. They brood over every hurt, disappointment, every “bad” thing that ever happened to them. They replay it over and over again in their minds, and to whomever they find to listen; oftentimes their version is not without added fabrication, portraying themselves as completely pristine victims who have never harmed anyone in any way, shape or form. Soon they spew venom all over the current recipient of their rage or whoever else is conveniently located to receive it. Unforgiveness and bitterness is satan’s hook in many a nose. We can leave unforgiveness and bitterness to fester until it putrefies, poisoning our hearts and minds. We will burn all of our bridges, kill relationships, and drift so far from God we don’t even want to see/hear of Him anymore. Unforgiveness, bitterness and resentment is terrible and highly destructive; it has caused people to literally hate their own flesh and blood. During difficult times it’s natural to feel like you’re beating your head against a brick wall and that all your efforts aren’t worth one moldy bean to anyone. Though we may feel this way, it is not true. I did not always know this. As a matter of fact, for 30 years this is exactly what I thought and how I felt. What I eventually came to understand is that all of my efforts, the sacrifices – the blood, sweat and tears – were actually important to God; I was not invisible to Him – to Him I mattered! When the rain stops, and the wind settles, it is God we’ll need to have pleased. Remembering that what we do in this life – good or bad – will be justly rewarded by our Almighty Creator helps keep things in perspective, especially when trials cloud your view. I know, I know, easier said than done right? I know how difficult it can be, especially when your situation seems hopeless and all those around you are veritable fountains of negativity. It can be done, however. Where your mind goes your emotions/feelings and body will follow. I wish I had understood this 35 years ago! I believe there is a reason we are instructed in the Word of God to think on certain things. In order to keep your spirits above the fray, it is imperative that we think right. You can choose to constantly rehash all of the problems, trials, mistreatment etc… of past storms, or you can obey Scripture and keep your heart and mind on the right things. We hold the remote control to our minds and our mouths. What we talk about is just as important as what we think about. Do not let the tempest cause you to speak out of your emotions and say things that are in opposition to God’s Word. I have heard people who regularly do this without ever realizing they were actually calling God a liar! We also have to watch who we are talking to! It is not good to talk to any/everybody about your problems. Get in the habit of talking to God first and always, and then allow Him to lead you to the right person for counsel. You need someone who is able to encourage you AND tell you the truth, not join the pity party and/or use your words for gossip fodder (Prov 18:2; Psalm 1:1-6; Col 2:8; Phil 4:6-7; Mat 11:28; ). Learn to give thanks in all things. I cannot stress this enough. Finding the blessings in the storm provides encouragement and hope. It provides strength as you hang on to what God has done, and see how He is working on your behalf even in the dark moments. When I look back on things I can see numerous things to be thankful for. I am grateful that God pegged me for the firstborn of my family. Why? It’s because, out of the 8 of us, I was the best one for the job. I’m not bragging in any way; it’s just the truth. God knew best and, therefore, the 8 of us never had to be separated, put in foster care etc. I am also thankful for my life, since I could have died at 21 due to status asthmaticus! There is always something to be thankful for; just start looking at what you take for granted! Make it a habit to think about those things, and give God thanks for His goodness towards you – even when it gets hard to see. God has taught me a lot over the past 9 years, and continues to teach me. He’s taking me from the people pleasing, burden bearer that I was to the God pleasing child of God He wants me to be. I still have much growing to do, I am sure, but I am happy to say that I live and breathe better today that I have in over 30 years. Life comes with its share of storms, from that we cannot run away. Learning how to successfully survive them is imperative if we are to avoid being damaged physically, mentally, emotionally, and spiritually. ***P.S. My parents, after being separated for a number of years, have been back together for 21 years now; phew, time is moving so fast it’s frightening! Wow amazing post Juanita. I was just thinking about something i read a while back and this post reminded me of how our conversations we have with ourselves, others and most importantly God are so very important. What i got out of this post is that communicating is not only what we say but what we take in as well. If we allow others to communicate negatively to us (no matter how well intended) we could be subject to more unnecessary storms. Also if we have much thanksgiving in our hearts and tell the Lord thank you for every trial and test we are certain to be overcomers. Thats how we communicate to Him. Thanks so much for taking time to read and comment on the post. When going through trying times it an be difficult to remember those all important simple things, such as our communication with God and others. And being thankful? How hard that can be when we are being bombarded by life’s tempest. We would all benefit from developing the skills of thankfulness, proper communication etc…when our lives are calm so that they will automatically come into play when the storms are raging. A great post with lots of thought provoking points. I think it is so important to be thankful and thinking showing gratitude everyday can improve your life significantly. Thank you for sharing this wonderful advice. Being thankful is a powerful thing. I think it can improve life because it changes the way you view it; instead of focusing on the “bad” you have to focus on the positive, finding reasons to be thankful for the good in the midst of trouble. I am glad you found the post beneficial. Thank you for reading and commenting on it. Thank you for all of these beautiful thoughts! It’s so true that we should always talk to God first and always. And I’m proud of you for sticking it out with your family when your Dad left. Your mom is so blessed to have you! I appreciate your kind words. God, I have learned, is the first (and sometimes only) one we need to talk to regarding everything that has to do with us. Earlier today I was thinking about this post and realized that I need to add a “P.S.” to it. I forgot to tell you all that my parents, though separated for a number of years, have been back together for 21 years now (married a total of 46 years in December). Thank you for reading and commenting on the post; I am glad you enjoyed it. This is so great to always remember. Wow, Juanita. You’ve been through it. When you start to feel out of control, do the opposite of what you feel. This really spoke to me. The idea that I cannot trust my first instinct when I’m hurting is troubling but true. Too many times I’ve reacted instead of being disciplined. Also I tend to share my troubles with anyone who will hear me. It’s not fair to them and it’s not holy. God wants my dependence on him as my first source of comfort. Anyway, you speak from wisdom. Thanks for sharing. Thanks for taking time to read and comment on the post. Yeah, I’ve been through a lot; however, we don’t really get through life pain free. I’ve had much to deal with in my earlier years, so I’m looking forward to more peace and less struggles for the rest of it ;D.
I really believe God gave me (when I was a teen) to do the opposite of what I feel. Because of the role I had to take in my family I could not be ruled by emotions; that would have been a disaster! God knew this, and gave me what I needed for the job. It’s not always easy to place our full dependence on God, but it is worth it to train ourselves to do so. He is up to the task, so there’s none better to tell our troubles to. I am so happy to know you found the post beneficial. Great post! I was especially struck by the thought of doing the opposite of what you feel in order to control your emotions, not be controlled by your emotions. That’s really giving my mind a work out! I’m going to keep thinking on that. Thanks! Thanks you for taking time to read and comment on the post. Doing the opposite of what I feel is something I started while in my teens. Trust me, it really works! I am so happy to know you found the post beneficial. Great timing for this blog with all the storms raging in our society. We need more people to discuss ways like these so we can help those who are struggling. God bless. Thank so much for reading and commenting on the post. These are trying times we live in and, as believers, we have to be able to help others. Sometimes the best way to help is by sharing the often hard earned wisdom we have gained through life’s experiences. Juanita, thank you for these reminders of how to have peace even in the storms. Juanita, dear @PerfectingTruth Twitter friend, what a wealth of wisdom you have! Sister, this post is filled with great wisdom and maturity! I tweeted as I read, and I hope you get a wide audience for this and that it’s widely read and shared. These eight practical, godly tips for managing the difficulties of trial and hard times come from your time of being forged in the fire and coming out as purified gold. This is priceless! God bless you! Thank you for sharing your wisdom and God’s truth! Thanks so much for taking time to read the post and comment. I appreciate your kind words. I am thankful to God for the lessons learned. I mean, it would be horrible to go through such hardship having gained nothing from it! It is my prayer that sharing a bit of my story and lessons learned will be a help to readers who are enduring their on stormy seasons. Thank you, @MelindaVInman, for sharing this with others on Twitter; I appreciate that! It’s great to connect here as well as on Twitter! I’m really glad! These are great tips, Juanita! Every last one of them is so important. Thanks for taking the time to read and comment. I am glad you found the post beneficial. Hi! I’m your neighbor at #FreshMarketFriday! These is such good heartfelt advice and so true. Yes, they may be hard to do, but we can trust God with our lives. Even if things are so hard and we grow weary, He still is with us to help us through the storms. Blessings to you! Thanks so much for taking the time to read and comment. It is often not easy to do as we should, especially when we are going trough hard times; however, it is so worth it. It is wonderful to know that when we grow tired the Lord is there to help us carry on! Very helpful list. Yes, pull the LORD close and never forget His words, especially His promise of carry you through a storm in life. I have a couple thoughts about life during dark times. Numbers 5 and 8 go hand in hand. If someone you loved and trusted has crushed you it is important to talk and work through those emotions. I know from past experience your church many not be supportive and one should not speak to family or friends because they are too close to you and perhaps the person, as well. If one cannot afford a professional counsellor, what then? I would try a minister or priest at another church if they are willing. Also, look for a Christian group on the Internet that is open to praying for you, and listening to how to you are feeling without telling you what to do about it. A proper counsel will suggest many ways that help people to rise up again in a way that you can choose from them. Thank you for reading the post and sharing your thoughts. I agree that we have to be very careful who we talk to about our issues and, you are right, oftentimes family are not good candidates. I also know from experience that churches can be lacking in the area of care as well; sad but true. It is so important for believers to remember to help those who are hurting and in need, especially those of the household of faith. I personally went to a Christian counselor in my area back in 2012, and it was a tremendous help!